Sleek and striking with its stainless steel build, the 20 oz. Hollywood Tumbler will be the constant companion to all its recipients this fall and winter. Your leads can take the comfort of a hot cup of tea, coffee, or cocoa with them no matter where they go! Meanwhile, your logo will be on prominent display all day long. With the fall season comes football, campfires, and cozy movie nights! Whether your leads and employees can be found in the stadiums, outdoors, or in their living room on the weekends, they can take the Fold Up Tote Blanket with them anywhere! With your imprint on the side, they and all their friends will know who to thank for keeping them comfy. Why settle for one fall promotional product when you can get a set of three with full color imprints in one easy step? The 3-Piece Cold Weather Set comes with a hat, scarf, gloves with conductive fingertips for touchscreen use, and an accessory bag. Display your logo on the hat and scarf in full, vibrant color! No matter the weather, the Port Authority Fleece Pullover Sweatshirt is a fall and winter staple. Made with air jet yarn, this sweatshirt is soft and touchable, but won’t pill, ensuring it lasts all season long! You can choose from 43 colors and three different locations for your imprint, so you can create stylish yet effective branding that your leads are sure to appreciate. Wherever your leads travel this season, make sure they always have some warm soup or beverages at the ready with the Daytripper Gift Set. The set includes two stainless steel travel mugs and one 25 Oz. stainless steel Thermo-Go bottle complete with your screen-printed imprint. The set comes packaged in a convenient non-personalized carrying case. 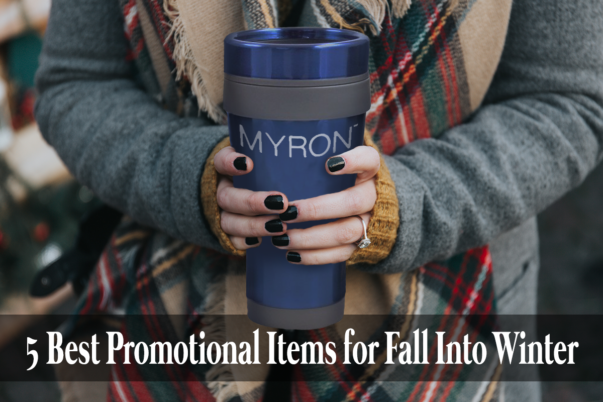 Trust Myron to keep your brand on top with promotional products for every time of year!